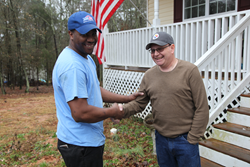 ARS/Rescue Rooter Atlanta, a network provider of air conditioning, heating and plumbing services, gave back to a military family in need by installing an HVAC system free of charge. Shaun and Denise Clontz are recipients for the ARS Cares initiative which aims at donating an HVAC system or water heater to veterans in need. ARS/Rescue Rooter Atlanta, a network provider of air conditioning, heating and plumbing services, gave back to a military family in need by installing an HVAC system free of charge. Shaun and Denise Clontz are recipients for the ARS Cares initiative which aims at donating an HVAC system or water heater to veterans in need. For the Clontz family in Bethlehem, GA, the donation could not have been timelier. The Clontz family is an Atlanta-based family with three children, and father Shaun Clontz served from 2009-2010 in the Army. Since his return from Afghanistan, Shaun and his family have noticed a significant decline in the performance of their HVAC unit; it had not been sufficient in combating the cold temperatures during the winter. “The freezing temperatures have been really hard on the family,” says Denise. “Trying to stay warm and living on space heaters has been tough.” The family reached out to ARS in Atlanta, and the technician that appraised the Clontz’s system told ARS’ General Manager David Buhle of their situation. “We thought it would be a great idea to donate a system to this family,” says Buhle. The team at ARS/Rescue Rooter Atlanta donated a Nest Learning Thermostat in addition to a new updated system, which not only will keep but their comfortable but save them energy and money, too.